Image via WikipediaMultiverse (n.) - Simply put, multiple universes that are linked together. More specifically, a set of interrelated parallel realities, usually involving characters that jump between universes to visit and interact with alternate versions of themselves and/or their history. While this term has been extended to any parallel universe story, like that found in The Chronicles of Narnia, it is most often associated with comic book franchises, particularly the DC Comics universe, which had its multiverse grow so expansive and unwieldy that it destroyed it in the seminal Crisis on Infinite Earths (and has since brought it back -- sort of -- in the recent Infinite Crisis). Uplift (n.) - The process by which one species genetically engineers another into a more "advanced" state. In most science fiction examples, this involves gene-hacking animals to give them human-level intelligence, and possibly anthropomorphized bodyshapes. This notion was first popularized by H.G. 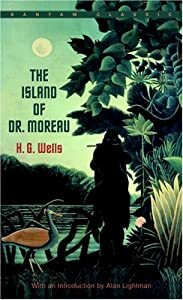 Wells in The Island of Dr. Moreau. In other equally famous stories, uplift by extraterrestrial agents led to the rise of humanity, as was implied by the presence of the monolith in Arthur C. Clarke's 2001: A Space Odyssey. (The same aliens/gods/unknowable beings would uplift life on Europa in the 2001 sequel, 2010.) The specific term uplift is today most often identified with author David Brin, who wrote a series of novels set in the Uplift Universe, notably including the classics Startide Rising and Sundiver. I bring it up because: 151 years ago today -- June 18, 1858 -- Alfred Russell Wallace sent a copy of his theory of natural selection to Charles Darwin, one which matched the latter's own ideas to a striking degree, prompting Darwin to finally publish his theory of evolution. Uplift is often mistakenly referred to as "forced evolution" when evolution itself is a natural process with no more a goal than a rainstorm or an earthquake. We aren't "destined" for intelligence or opposable thumbs, it just worked out that way, and playing with the notion of applying our own human-centric ideas of "advanced states" to other species' biology makes for some philosophically intriguing fiction, and often some pretty compelling space opera, too.